For cooking restaurant-quality fried foods at home this simple-to-use deep fryer uses the same frying technology found in commercial fryers. Its Dual Zone technology creates a "cool zone" located beneath the heating element to prevent food from burning and to help reduce odor and keep oil clean. The unit's extra-large 3-pound food capacity provides ample space for evenly frying everything from delicious French fries and onion rings to mozzarella sticks or doughnuts. 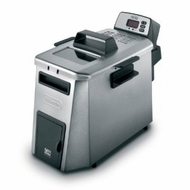 The fryer's digital adjustable thermostat with an indicator light supplies the control and flexibility needed to fry foods according to individual preferences while its permanent mesh filter prevents the release of oil vapors and odors into the kitchen. Other highlights include a digital timer a viewing window an oil-drain system a removable heating element for convenient cleanup and a magnetic cord that detaches if accidentally pulled. The deep fryer measures approximately 10-2/3 by 17-1/3 by 10-5/6 inches and dishwasher-safe parts make cleanup a snap.